European Public Procurement Law is the ultimate legal resource on public procurement law in the European Union. It combines the full text of the new Public Sector Procurement Directive 2014/24/EU with 141 relevant judgments rendered by the Court of Justice of the European Union during the period 1982–2014. Constant De Koninck, Thierry Ronse and William Timmermans provide expert commentary on the impact of the Public Sector Procurement Directive 2014/24/EU and analysis of the case law. An insightful overview of the key changes introduced by the Directive is also included. 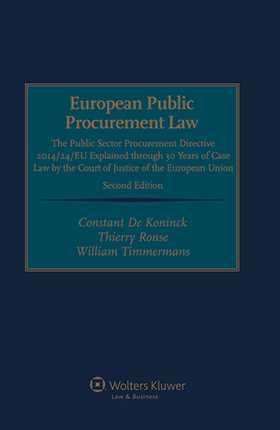 This new edition connects the reader with the relevant CJEU case law, which has been instrumental in interpreting the public procurement legal framework. It is of great value for legal practitioners and has a clear practical use for officials who have to ensure that contracts are awarded in an open, fair and transparent manner, allowing domestic and non-domestic firms to compete for business on an equal basis, all this within the EU legal framework and in compliance with the new Public Sector Procurement Directive 2014/24/EU. an extensive subject index disclosing the CJEU case law and a general index combining the new Directive’s articles with the relevant recitals of the Directive’s preamble. The second edition of European Public Procurement Law is an essential guide for legal practitioners and officials working in the field of public procurement. The title includes the full text of the Public Sector Procurement Directive 2014/24/EU, with the implications of this directive fully explained through the expert analysis of 30 years of relevant jurisprudence. Chapter 1. The EU Procurement Directives 2004/18/EC and 2004/17/EC. Section I. The Public Sector Directive 2004/18/EC. Section II. The Utilities Directive 2004/17/EC. Chapter 2. Judgements Rendered by the Court of Justice in the Period 1982–2007 Regarding Public Procurement—Analysis. Section I . Analysis of the Case Law Relating to Provisions of the Public Sector Directive 2004/18/EC. Section II. Analysis of the Case Law Relating to Provisions of the Utilities Directive 2004/17/EC. Chapter 3. Judgements Rendered by the Court of Justice in the Period 1982–2007 Regarding Public Procurement—Relevant Excerpts. 1. Relevant Articles of the EC Treaty. 2. Interpretative Communications of the European Commission. 3. Explanatory Notes by the European Commission. 4. Table of Cases Before the European Court of Justice Arranged According to the Date of Judgment. 5. Table of Cases Before the European Court of Justice Arranged According to their Case Number. 6. Alphabetical Table of Cases and Parties.